Can I change the pledge on my goal? You can step down the pledge one level at a time. Like all changes that make the goal easier, each step takes 7 days to take effect. Click the pledge amount in the top line of the goal page to bring up the pledge settings, then click the Decrease Pledge button. Your goal page will refresh, and the pledge amount will change to indicate the pending stepdown. After the stepdown finishes, the $30 → $10 will change to $10 and my next derailment will only cost me $10. We call this short-circuiting, and it's a feature of the Beemium premium plan. Short-circuiting takes effect immediately but can't be undone immediately, so be sure you're certain before you do it! 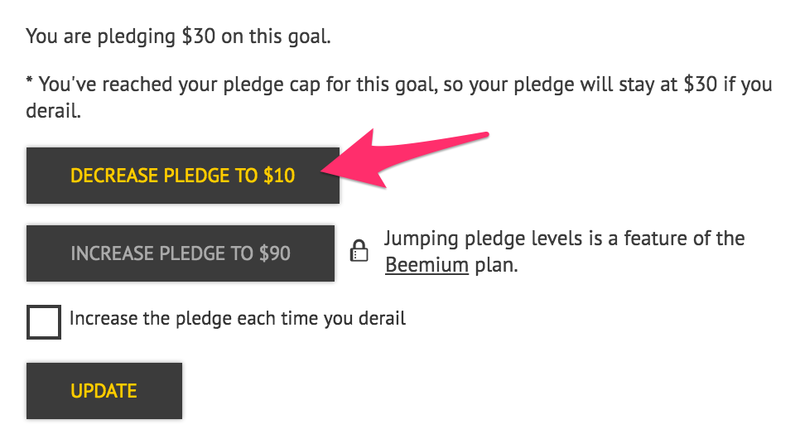 To short-circuit a goal, click the pledge amount in the top line of the goal page to open the pledge settings. Press the button to Increase Pledge to up the ante.